Graph and Rank Regularized Matrix Recovery for Snapshot Spectral Image Demosaicing. Automated Architecture Exploration for Low Energy Reconfigurable AGU. Holographic Displays and Smart Lenses Micromirror arrays for next generation vision systems. MEMS based micromirror arrays for vision systems and display applications. Playing the Trade-Off Game Architecture Exploration Using COFFEE. Reconfigurable AGU: An Address Generation Unit Based on Address Calculation Pattern for Low Energy and High Performance Embedded Processors. Distributed Loop Controller for Multi-threading in Uni-threaded ILP Architectures. EMPIRE: Empirical Power/Area/Timing Models for Register Files. Interconnect-Exploration for Energy vs Performance Tradeoffs for Coarse Grained Reconfigurable Architectures. Locality Optimizations in a Compiler for Wireless Applications. Address Generation Optimization for Embedded High-Performance Processors: A Survey. Efficient Method to Generate an Energy Efficient Schedule using Operation Shuffling. Methodology for operation shuffling and L0 cluster generation for low energy heterogeneous VLIW processors. Clustered Loop Buffer Organization for Low Energy VLIW Embedded Processors. Instruction Buffering Exploration for Low Energy Embedded Processors. Matador: an Exploration Environment for Systems-Design. 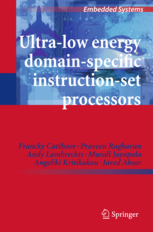 Ultra-Low Energy Domain-Speciific Instruction-Set Processors. Roadmaps on Selected topics in Embedded Systems Design from the ARTIST project. Low Energy Instruction Memory Organization for Embedded Processors. Silicon-Quartz Microcapillary Opto-Fluidic Platform Obtained by CMOS-Compatible Die to Wafer 200 mm Dual Bonding Process. System-level Analysis and Design for RGB-NIR CMOS Camera. Towards Practical Cost Effective Lens Free Imaging. Non-negative Matrix Completion for the Enhancement of Snapshot Mosaic Multispectral Imagery. Characterization of VNIR Hyperspectral Sensors with Monolithically Integrated Optical Filters. Lens-free holographic imaging of microscopic objects using photonic structures and CMOS imagers. A CMOS-compatible integrated approach to hyper- and multispectral imaging. Monolithic Integration of Flexible Spectral Filters with CMOS Image Sensors at Wafer Level for Low Cost Hyperspectral Imaging. Low-complexity image processing for a high-throughput low-latency snapshot multispectral imager with integrated tiled filters. Compilation Technique for Loop Overhead Minimization. Systematic Architecture Exploration based on Optimistic Cycle Estimation for Low Energy Embedded Processors. Operation Shuffling over Cycle Boundaries for Low Energy L0 Clustering. Cost-aware Strength Reduction for Constant Multiplication in VLIW Processors. COFFEE: COmpiler Framework For Energy-aware Expoloration. Energy-Aware Interconnect Exploration for a Coarse Grained Reconfigurable Processor. Locality Optimization in Wireless Applications. Semi Custom Design: A Case Study on SIMD Shufflers. Impact of ILP-improving Code Transformations on Loop Buffer Energy. Enabling WordWidth Aware Energy and Performance Optimizations for Embedded Processors. A Customized Cross-Bar for Data-Shuffling in Domain Specific SIMD Processors. Architectures and Circuits for Software Defined Radios: scaling and scalability for low cost and low energy. Very Wide Register: An Asymmetric Register File Organization for Low Power Embedded Processors. Instruction Transfer And Storage Exploration for Low Energy VLIWs. Distributed Loop Controller Architecture for Multi-threading in Uni-threaded VLIW Processors. Efficient Architecture Exploration of a Clustered Loop Buffer. "Operation shuffling for low energy l0 cluster generation on heterogeneous VLIW processors" Y.Kobayashi, M.Jayapala, P.Raghavan, F.Catthoor, and M.Imai, in IEEE Workshop on Embedded Systems for Realtime Multimedia (ESTIMEDIA), September 2005. Energy-Aware Interconnect-Exploration of Coarse Grained Reconfigurable Processors. Power Breakdown Analysis for a Heterogeneous NoC Platform Running a Video Application. Design Style Case Study for Compute Nodes of a Heterogenenous NoC Platform. L0 Cluster Synthesis and Operation Shuffling. Instruction Buffering Exploration for Low Energy VLIWs with Instruction Clusters. Low Power Coarse-Grained Reconfigurable Instruction Set Processor. Clustered L0 Buffer Organization for Low Energy Embedded Processors. A Low Energy Clustered Instruction Memory Hierarchy for Long Instruction Word Processors. Software Pipelining for Coarse-Grained Reconfigurable Instruction Set Processors. Low Energy Clustered Instruction Fetch and Split A Loop Cache Architecture For Long instruction Word Processors. Inner Loop Code Generation for Coarse-Grained Reconfigurable Instruction Set Processors. CRISP: A Template for Reconfigurable Instruction Set Processors. Reconfigurable Instruction Set Processors: An Implementation Platform for Interactive Multimedia Applications.